When it comes to keeping kids safe around medicine, parents and caregivers are the first line of defense. But while most parents say they know how important it is to store medicine out of reach and sight, they aren’t always doing so. Sometimes parents underestimate how quickly their kids can get into medicine. Other times they think child-resistant packaging is childproof. Still other parents aren’t always sure what “out of reach and sight” really means. This Poison Prevention Week (March 18-24), Safe Kids Worldwide is releasing its newest research report, “Safe Medicine Storage: Recent Trends and Insights for Families and Health Educators.” The report, developed with support from Johnson & Johnson Consumer Inc., the makers of Children’s TYLENOL®, examines current trends in medicine poisonings among young children and looks at how parents store medicine. We learned that due to accidental medicine poisonings in the U.S., a child under age 6 goes to the emergency room every nine minutes, is hospitalized every hour and dies every 12 days. The report sheds light on this troubling situation and shows parents how they can protect kids around medicine. We’ve created a new shareable infographic to highlight the findings from the research and tips parents can use in their own homes. 1. Store medicine up and away, out of children’s reach and sight every time. Store medicine and vitamins in a cabinet where children can’t see them and out of reach, above counter height. 2. Remember child-resistant packaging is not childproof. So put medicine away immediately after every use, even if you need to give another dose in a few hours. 3. Put medicine out of reach and sight, even if you need to take another dose in a few hours. Remember to keep visitors’ purses, bags and coats out of children’s reach, as they may contain medicine. 4. Use safe reminder tools to help you remember when to take and give medicine. Set an alarm on your watch or cell phone. Write a note to yourself and leave it somewhere you look often, like on the refrigerator door. 5. Save the Poison Help number – 1-800-222-1222 – in your phone and post it visibly at home. The Poison Help number connects you with specialists at poison centers who can answer questions about how to give or take medicine and help with poison emergencies. Check out our full list of tips for families. 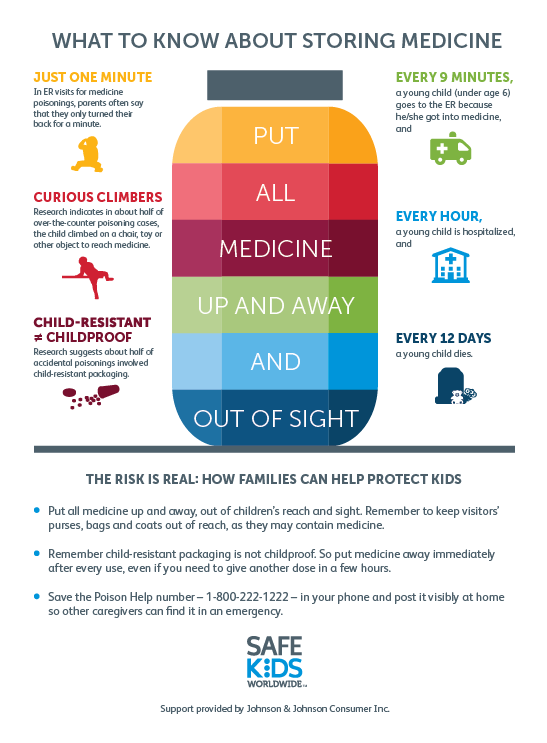 Check out this video to see what it means to put medicine out of reach and sight and for more tips to protect kids at home. You can also find the video translated into Spanish. Our own Gary Karton took to the streets to talk to parents about their own medicine storage habits. Here are more medicine safety tips. The Safe Kids Worldwide medication safety program was developed with support from Johnson & Johnson Consumer Inc.